After being in negative territory for two months, industrial production entered the green in July with a growth of 2.6 per cent although industry said it was too early to call it a recovery. Market regulator SEBI will soon notify new rules to make it easier for foreign entities to invest in Indian markets following finalisation of the necessary regulatory changes by the government for a major overhaul of the existing regulations for overseas investments. Bucking a weak broader market sentiment, shares of Financial Technologies (India) Limited and Multi Commodity Exchange of India today surged up to 18.25 per cent, after market regulator SEBI renewed the licence of MCX Stock Exchange for a period of one year from September 16. The government today approved a proposal to invest $4.3 billion in World Bank bonds, which will help the country secure additional funding from the multilateral agency for infrastructure projects. Apple's launch of two new iPhones raised fresh doubts about its strategy to expand its smartphone market share, prompting a slide in the company's shares and harsh analyst comments. A Group of Ministers (GoM) on revival of BSNL and MTNL today decided to refund the money paid by them for surrendering BWA spectrum worth more than Rs 11,000 crore. ONGC has approved a $560 million project for enhancing oil recovery at the prolific Rajasthan oilfields. Information technology firm iGate has appointed Ashok Vemuri as president and CEO with effect from September 16. The improved numbers were on account of improved performance of manufacturing and power sectors. Adding to the slightly better news for the economy, retail inflation eased slightly to 9.52 per cent in August over the previous month following softening in prices of almost all commodities, except vegetables. The retail inflation at 9.64 per cent in July. Factory output measured in terms of the Index of Industrial Production (IIP) had contracted 0.1 per cent in July last year, as per the data released by Central Statistical Organisation today. Meanwhile, IIP numbers for June was revised upwards to a decline of 1.78 per cent from a provisional 2.2 per cent dip in production. 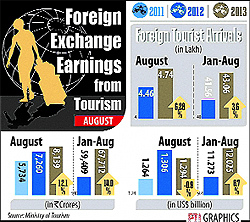 It contracted by 2.8 per cent in May this year. The manufacturing sector, which constitutes over 75 per cent of the index, grew by 3 per cent in July compared to zero growth in the month a year earlier. During April-July, the sector saw a decline of 0.2 per cent compared with a contraction of 0.6 per cent in the period last year. CII said in a statement that while the IIP numbers in the green are welcome though it is too early to presume that a recovery is underway. CII said coming on the back of positive developments on the rupee front, following the proactive announcements and measures by the RBI, this IIP data would ensure that it does not act a dampener as far as sentiments are concerned. 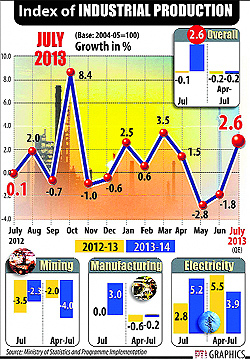 However, it added that the manufacturing sector in India was performing far below its potential. The entire problem of current account deficit is a result of this deficiency, and significant interventions are required to ensure that India’s manufacturing competitiveness improves. Under the new rules, which are likely to be announced in next few days, SEBI is creating a new class of investors — to be called Foreign Portfolio Investors (FPIs) — and would classify them in three categories as per their risk profile, senior officials said. The KYC (Know Your Client) and other regulatory compliance requirements for the FPIs would depend on their risk category and the norms would be easier for lower-risk investors. The proposals are based on former Cabinet Secretary KM Chandrasekhar committee report and were approved by SEBI in its board meeting in June-end. Thereafter, the regulator referred the recommendations to the Government of India for implementation. SEBI is merging different classes of investors such as FIIs, their Sub Accounts and Qualified Foreign Investors (QFIs) into a new category, FPIs, to put in place a simplified and uniform set of entry norms for them. The FPIs would be categorised into three categories — low-risk (for multi-lateral agencies, government and other sovereign entities), moderate risk (for banks, asset management companies, investment trusts, insurers, pension funds and university funds) and high-risk (all the FPIs not included in the first two categories). The third-category FPIs would not be allowed to issue Participatory Notes. The KYC requirements would be simplest for the first category and most stringent for the third class. The requirement for submission of personal identification documents of designated officials of the FPIs would also be done away with for the first two categories. Shares of FTIL settled 18.25 per cent higher at Rs 217.40 on the BSE. In intra-day trade, the scrip gained 28.58 per cent to Rs 236.40. MCX stock rose by 4.89 per cent to Rs 482.25. During the day, the scrip had touched its upper circuit limit at Rs 482.70. As the NSEL crisis continues to deepen, its group entity MCX Stock Exchange was asked by SEBI yesterday to strengthen its governance structure to continue to remain a recognised bourse. While renewing MCX-SX recognition for a period of one year, SEBI also asked MCX-SX Ltd to constitute a committee of two independent directors and 3 institutional investor nominees to oversee key business decisions, policy matters and appointments of top management. Similar directions were also issued to MCX-SX Clearing Corporation Limited, a subsidiary of MCX-SX. "The Cabinet has approved purchase of $4.3 billion bonds of World Bank," Information and Broadcasting Minister Manish Tewari told reporters after a meeting of the Union Cabinet chaired by Prime Minister Manmohan Singh. The RBI would invest in the bonds floated by the International Bank for Reconstruction and Development (IBRD), a lending arm of the World Bank. The bonds would be of various tenures and the RBI would get return on investment. India's headroom for borrowing from the World Bank is reaching the limit and investing in these bonds will widen the scope for more loans, a Finance Ministry official had earlier said. Some analysts said yesterday Apple had failed to slash prices enough to make an impact in key emerging markets or with budget-conscious buyers, and did little to show it has regained its edge in innovation. Shares slid 5.4 per cent to end at $467.71 in New York, a day after the technology giant presented the two new iPhones as part of an effort to regain momentum in the smartphone market. While the new iPhone 5C is being offered to US customers at $99 with a subsidised carrier contract, the unsubsidised price will be $549 in the US, and more than $700 in China. Analysts at the research firm Trefis said the iPhone launch "turned out to be a dampener of sorts, as the company priced what was expected to be a significantly cheaper iPhone at a hefty $550 and did not introduce any new products such as an iTV or an iWatch." "The Group of Ministers took firm decisions, one in relation to pension of MTNL employees, the second in relation to the spectrum that was allocated both to BSNL and MTNL in the 2.5 GHz band and one other small issue," Telecom Minister Kapil Sibal told reporters here. As per BSNL, there is no business case at such a high cost of spectrum. The government had given the spectrum to both companies, which paid auction prices for the airwaves. "Our Board earlier this week approved the Enhanced Oil Recovery (EOR) project for Rajasthan fields," ONGC chairman and managing director Sudhir Vasudeva said here. Cairn India, which owns 70 per cent of the fields, had in June last year submitted a draft EOR plan for the Mangala oilfield, the largest among the 26 oil and gas find it has made in the Barmer district block. ONGC, which holds the remaining 30 per cent interest in the block, did extensive studies before approving of the EOR investment plan. Vasudeva said the investment will be about $560 million which will be shared between Cairn and ONGC in 70:30 ratio. The funds are for drilling additional wells and other works, he said. After ONGC approval, the proposal will now go to the block oversight panel, called the Management Committee headed by oil regulator DGH. Cairn-ONGC joint venture will this fiscal drill 48 infill wells. These wells at a later stage will also be used for EOR which may include chemical intervention to sustain the plateau rates for longer times. Cairn, which currently produces over 175,000 barrels per day of oil from Mangala, Bhagyam and Aishwariya fields in the Rajasthan block, is targeting 215,000 bpd output by the turn of next fiscal. It has planned a capex of about $2.5 billion in next three years between financial years 2013-14 and 2015-16. The company had sacked former CEO Phaneesh Murthy in May this year over an undisclosed relationship with a subordinate woman employee. "After an extensive search process, we are delighted that Ashok will be joining iGate as president and CEO," iGate co-founder and co-chairman of the Board Sunil Wadhwani said. Vemuri will join iGate's Board of directors, the company said. Gerhard Watzinger, who was serving as the interim president and CEO since Murthy's exit in May 2013, will remain with iGate in an advisory role temporarily to assist with Vemuri's transition. Vemuri joins iGate from Infosys, where he was head of Americas and global head of manufacturing and engineering, besides being a Board member. In his role as head of Americas at Infosys, Vemuri was responsible for business operations in the company's largest region, with $4.7 billion in revenues.